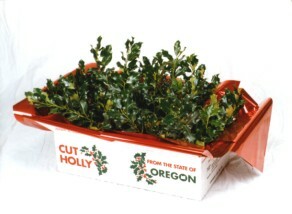 Send a distinctive gift box of fresh English Green and Silver Variegated Holly. Bonus pack of Oregon mistletoe included. Available in 3 and 5 pound boxes of mixed holly. We'd love you to visit! Call to set a time. Copyright © 2019 Mill Creek Holly Farms. All Rights Reserved | Website Design by All Pro Webworks, LLC.